Finally, you can understand her! If you’re like most men, you’ve burned up lots of energy trying to figure out what a woman wants, what makes her tick, and how to make her happy. The good news: success is simpler than you thought. 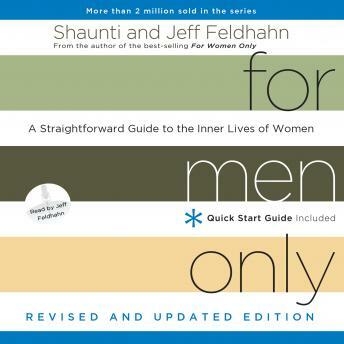 In their groundbreaking classic, For Men Only, Shaunti and Jeff Feldhahn reveal the eye opening truths and simple acts that will radically improve your relationship with the woman you love. For example: • Why she can’t “just not think about” something that’s bothering her. • How to get her real answers without games. • How your provider instinct can actually cause her heartache — and what to do about it. • Why “not tonight, honey” may not mean what you think. • Why listening to her feelings is so hard for a guy, and a fix-it plan that works. • Why her “I do” at the altar will always mean, “do you?” and the answer that rocks her world. Now updated with the latest scientific research to explain the fabulous female brain plus an all-new chapter that shows how to decode her most baffling behavior, For Men Only is your roadmap to making her happy.